I’m writing this off the back of one of the most unhealthy weekends I’ve had in weeks. I’m not some nut case fitness freak or anything, but I guess I’m getting to the point now where some kinds of takeaways and foodstuffs just crease me. I end up tasting them for days and paying for it for days too. This weekend was a bit different though. It was all in the name of “research”, so that’s ok then! 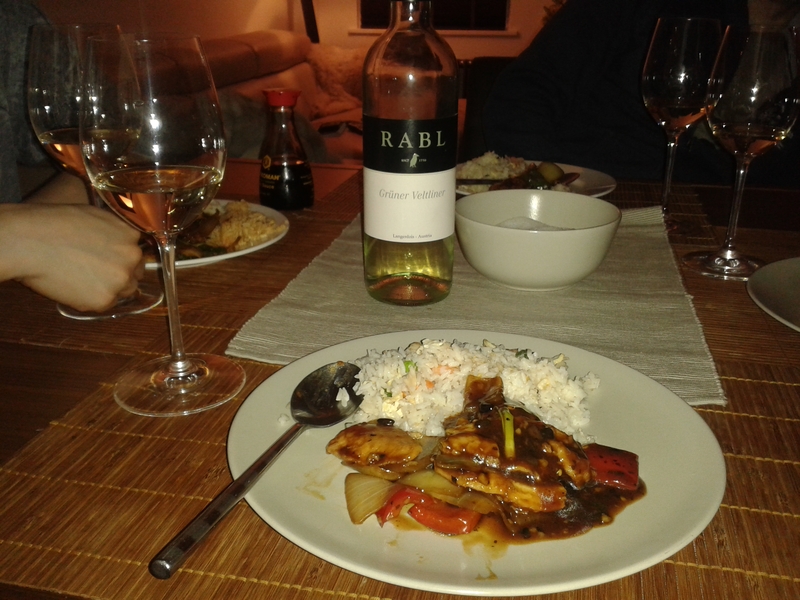 We started off with the Weingut Rabl from Spirited Wines, along with the chicken and black bean sauce. I might as well admit it now. It was a takeaway. The wine was a lot lighter than I’d expected. I didn’t really get a huge amount of minerality there, which on the better sites is something that develops on Grüner Veltliner. Green fruit and some citrus flavour which was very nice to drink on it’s own (well balanced acidity made it very refreshing), but it was just way too light to have with a fairly heavy flavoured food. I would buy it again, but probably just as an afternoon sip sometime over the summer. Next up was the Sainsbury’s Taste The Difference range. The green apple and lime flavours were again really well balanced, but this time there was a definite addition of minerality, which added really well to the body. We ate it with a bacon and haloumi salad, with some borlotti beans thrown in (there were some in the back of the cupboard!). The minerality in the wine went really well with the beans, and the extra body and high acidity coped well with the waxiness of the cheese and the saltiness of both the cheese and the bacon. At £7.49 this is an amazing value wine! Saturday night saw us hit the chippy for the first time in 2014. 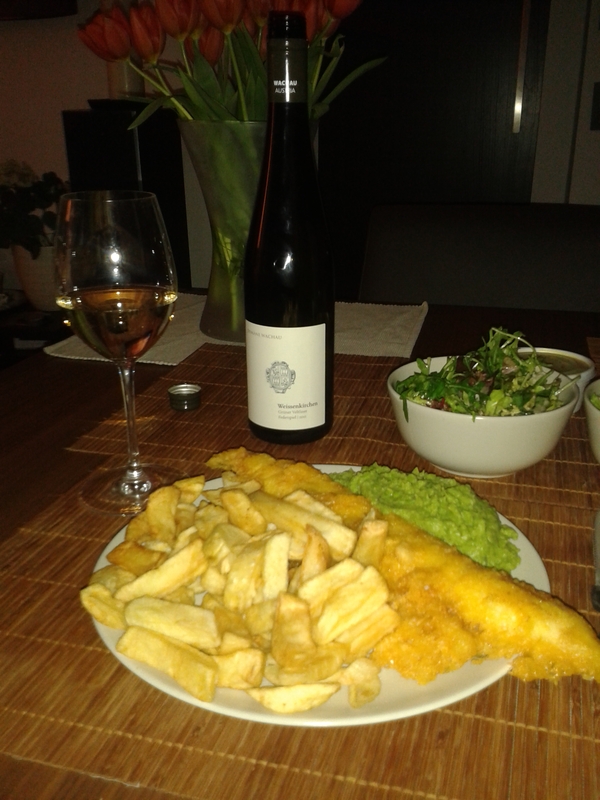 Haddock and chips and mushy peas coming my way, all to be washed down with Majestic Wine’s Weingärten Weissenkirchen. Very similar in style and taste to the TTD Sainsbury’s, but with a longer finish, it was absolutely perfect with fish and chips. Perfect. Again the naturally high acidity cutting straight through the battered fish, and the salted chips dragged the fruit flavour of the wine to the front. If you didn’t have a go at this pairing, find a time to do so. I thought it was great. The best food pairing, not even chippy gravy would have improved it! Overall my feelings on Grüner Veltliner are really positive. Not sure if it’s just something I’ve been brought up with, but lighter styles of white wines, suitable for a cheeky afternoon glass here and there really float my boat. 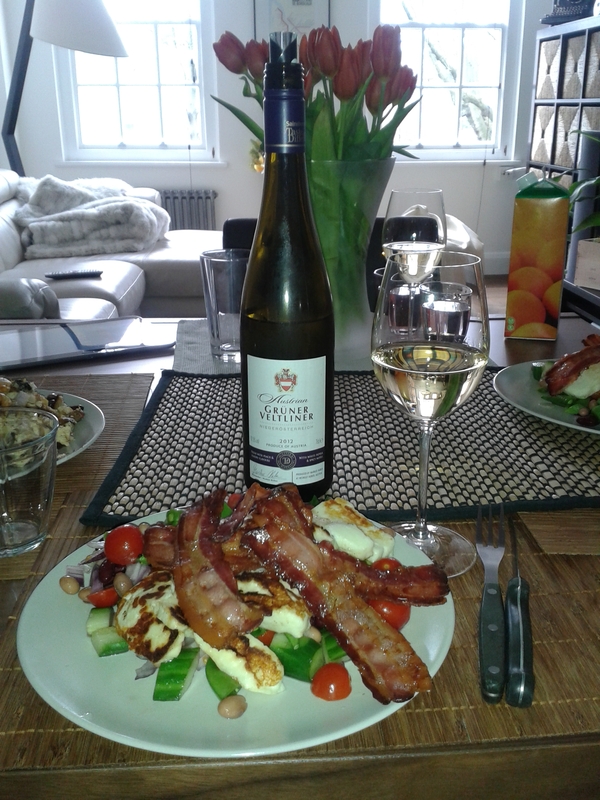 The lighter style of Grüner Veltliner does just that, and the slightly heavier bodied mineral flavours cope great with the salted foods that my Scandinavian missus loves. We were big fans and will definitely be back for more. My Sainsburys didn’t have the TTD in stock! I did try and buy one from a wine bar in Waterloo station yesterday, but when I asked for a GV the barmaid looked at me quizzically and then handed me a bottle of Gewurtz! Fail! Did you correct her abruptly, or go do the english thing of “no thanks” and scuttle out awkwardly? What do you think?! I was just as embarrassed as she was. She had no idea what I was talking about, but didn’t want to admit it. Not great customer service!